Chocolate and raspberries are the perfect ending to a very special Passover seder. Combine butter and sugar in small bowl. Beat at medium speed, scraping bowl often, until creamy. Add chocolate; continue beating, scraping bowl often, until well mixed. Add egg product; continue beating, scraping bowl often, until very creamy. Stir in raspberry liqueur, by hand (liqueur is optional). 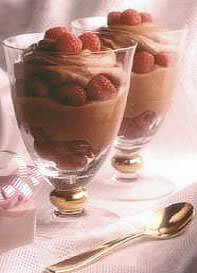 To serve, place 4 raspberries in bottom of each of 4 parfait glasses. Top with 1/4 cup chocolate mousse, 4 raspberries and 1/4 cup chocolate mousse. Garnish with remaining raspberries. Store refrigerated. Any remaining mousse can be stored in the refrigerator up to 2 days. Use kosher products for Passover, available at specialty food markets.